The hotel offers a restaurant. Guests can unwind with a drink at one of the hotel's 2 bars/lounges. This 3-star property offers access to a 24-hour business center. Wireless Internet access is complimentary. 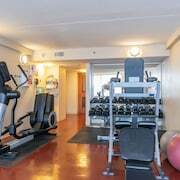 This eco-friendly hotel also offers a 24-hour fitness center, multilingual staff, and complimentary newspapers in the lobby. A roundtrip airport shuttle is complimentary to guests (available 24 hours). Onsite parking is available (surcharge). 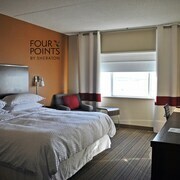 Four Points by Sheraton Winnipeg International Airport is a smoke-free property. Along with a restaurant, this smoke-free hotel has 2 bars/lounges and a 24-hour fitness center. Free WiFi in public areas and a free airport shuttle are also provided. Additionally, a 24-hour business center, self parking, and 24-hour room service are onsite. All 150 rooms provide conveniences like refrigerators and microwaves, plus free WiFi and TVs with DVD players. Guests will also find 24-hour room service, separate bathtubs and showers, and coffee makers. 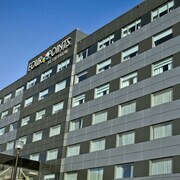 Four Points by Sheraton Winnipeg International Airport offers 150 air-conditioned accommodations with DVD players and safes. Refrigerators, microwaves, and coffee/tea makers are provided. Rooms have partially open bathrooms. Bathrooms include separate bathtubs and showers and hair dryers. Guests can surf the web using the complimentary wireless Internet access. Business-friendly amenities include desks and complimentary newspapers; free local calls are provided (restrictions may apply). Additionally, rooms include complimentary bottled water and irons/ironing boards. Housekeeping is offered daily and hypo-allergenic bedding can be requested. Gateway Restaurant - This restaurant serves breakfast, lunch, and dinner. A children's menu is available. Four Points Sports Bar - This sports bar serves lunch and dinner. Gateway Lounge - This lobby lounge serves dinner only.